Of all the terms one could use to describe a video game soundtrack—exhilarating, emotional, sad, uplifting, lonesome, boisterous—the word "sloppy" almost never comes up. Seriously, pause for a minute and name a video game with a sloppy soundtrack. Unless you're talking about a poorly-played Rock Band track or a bar pianist in Red Dead Redemption, they're few and far between. There's no denying that video game music is almost always excruciatingly orderly. The music is performed just so—the instruments are perfectly in tune, the rhythms metronomically precise. Video game arrangements are methodical, not spontaneous. Why is that? There's no single answer, but it's gotta be due at least in part to the fact that gaming's musical heritage comes from carefully programmed, necessarily minimalist chiptunes. The 8-bit melodies from Super Mario Bros. and Mega Man were carefully organized to eke every possible bit of melody and rhythm out of a limited number of possible voices in a limited amount of space. That tradition has carried on to the present day, and coupled with the generally controlled, carefully programmed nature of video games themselves to make music that, while often beautiful, is controlled to within an inch of its life. 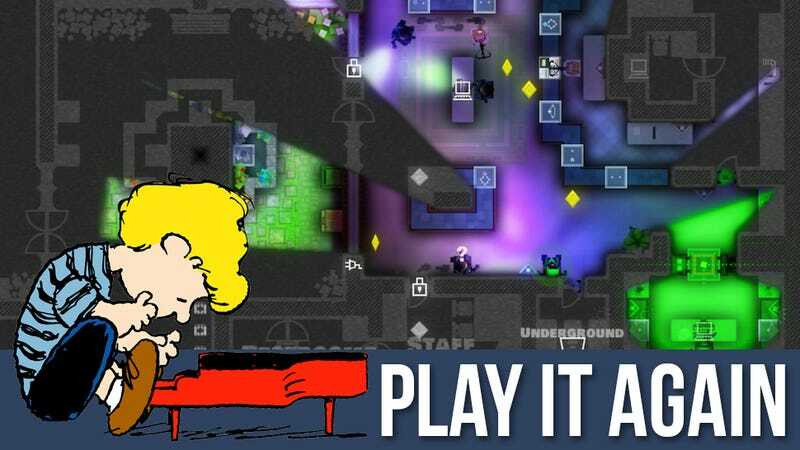 Pocketwatch Games' excellent heist game Monaco is often a sloppy affair. In fact, the game is at its best during moments of sheer chaos. While there may be moments of a given level where you'll feel one step ahead of your pursuers, smooth as Danny Ocean, it's just as likely that you'll wander into a crowded security station and freeze for a moment, Wile E. Coyote-style, before sprinting for the nearest air-duct, security in hot pursuit. So it's fitting that Austin Wintory's soundtrack feels as chaotic and sloppy as the game it accompanies. The music is a departure for Wintory, who is best known for his Grammy-nominated work on last year's triumphant Journey. The Monaco soundtrack consists entirely of silent-film-style solo piano (played by Wintory himself), and is notable not only for its instrumentation, but also for its performance. Wintory often rushes, pushing ahead of the beat, before dramatically slowing down, dropping the sustain pedal, then pushing ahead again. It's often uncomfortable, lurching forward and back again like a boat on uncertain waters. Large chunks of the game will play out in near-silence, until your thieves are spotted, then suddenly! Hurried glissandos and stomping chords materialize to accompany the Looney Tunes-like action of a heist gone wrong. When I first fired up Monaco, I was taken aback. "Really?" I thought, "This is the soundtrack to the game? It's just piano?" But as I got used to it, I came to really like it, and now I can't imagine the game without it. Not everyone has been won over; I've spoken with a few people who have mentioned that they'd rather Pocketwatch had gone with something more traditional. Tremolo guitars, cool synths, Mancini horns... you know, "proper" heist music. I emailed a bit with both Wintory and Monaco's creative director, Andy Schatz, and asked them about the soundtrack. First of all, I asked Schatz why he decided to go the route he did. Why not do something more traditional? "I was attracted to the mood of silent movie ragtime piano: the music felt sneaky, naughty," he says. "Not evil and adrenaline pumping, more light footed — criminal with a smirk. Silent movies, when played at that fast-forward speed that we typically view them at, have a certain farcical silliness that was perfect for Monaco." Monaco is a visually intricate game, but it's certainly not photorealistic; Schatz says that the music was designed to enhance its abstract qualities. "Given that it was music intended for silent movies," he says, "I felt that the piano might just trigger the player to subconsciously think, 'I need to fill in the blanks here. The graphics are simple, I'm far removed from the action, but it's up to me to use my imagination to create that immersion.'" "The solo piano and genre aesthetic were both [Andy's idea]," says Wintory. "He brought me on with the question, 'Can you do this?' In our first call I improvised over the phone some stuff on the fly in this style and he said, 'You're already playing Monaco,' so I got the job." I asked Schatz why they made the music feel so sloppy and human. "That was all Austin—he wanted the game to feel as if someone was actually in the room with you, playing the piano, the way you would have someone actually playing the piano in a silent movie hall. His dream is to make a game that feels as if the score is being composed and performed on the fly." Wintory's primary instrument is the piano, but he considers himself a conductor first and foremost. The performances in Monaco bear that out; they're clearly the work of a player familiar with the instrument, but they're not on the level of the kind of pro soloist that Wintory easily could have hired. "I started piano at 10," Wintory tells me, "and composing almost simultaneously, so it's always taken a back seat. But my childhood teacher was a jazz cat so genres like this are definitely not a huge leap. That said, I try to make everything I do feel uncomfortable and like a leap of faith. I try to constantly get outside of the 'wheelhouse' because I never want it to go stale. I would rather go down in flames in a gloriously disastrous experiment than just kick back and rehash." "His dream is to make a game that feels as if the score is being composed and performed on the fly." Wintory admits he did cheat a bit with some of the faster stuff. "Most of what you're hearing is not real-time performance. I sampled the pianos myself for the game (in some cases combined with sample libraries) and when I played them in, for the really really hard stuff, I would turn the tempo down and track it much slower. So it's a 'produced' performance in that sense." I asked Schatz if he worried that the distinctive but decidedly odd soundtrack would turn off some players, who might have come to the game expecting music more in line with the James Bond-meets-Ocean's Eleven vibe of the game. Did he encounter anyone in testing who said they'd rather have a more traditional soundtrack? No, Schatz said. "The choice of music was made long before I ever considered marketability. And anytime I started considering adding something more traditional, it just ended up making the game feel less unique, feel more like the standard pablum that gets pumped out daily. This was an easy hill to die on." The more I play Monaco, the happier I am that Schatz and Wintory went the direction they did. I can easily imagine the game with a more traditional soundtrack, and actually, that game would've been just fine. Cool, even. But this weird, banging solo piano is just so distinctive, it makes an already idiosyncratic game stand apart even more. The world has enough shimmering, immaculate video game soundtracks. We could do with a little bit more sloppiness. You can purchase the Monaco soundtrack, complete with some killer bonus remixes, here.